Rossi is spotted at Misano wearing an Arai Ram 4, camouflaged as an AGV one, with stickers on top, based on the design he used last year. 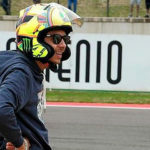 Rossi has always been associated with AGV. The Japanese manufacturer spread the photos through social media.